Don't have a 64gig SD card, but just tested the linked instructions on a 64gig USB key and it works fine. I've tested it yesterday. Works great with SanDisk Ultra. Do we know if there's a meaningful difference between Ultra and Extreme SD cards for use in the Deluge? Fyi for those that come later, mine came this week with an 80Mb/s read time SD card. This corresponds to SanDisk "Ultra" speeds, so you can safely save a few bucks vs the Extreme, I'd guess. I've posted elsewhere (on Facebook), that I am using a 256 GB SD Card from Kingston, formatted as FAT 32. 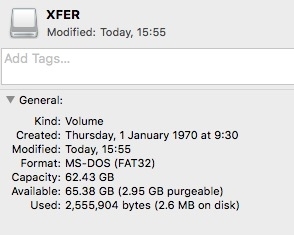 I did not have to use the MAC program above, I just used disk Utility to format it. Is anyone else using 256gb or even 512? DrMatt, can you please post the particular model of the Kingston SD you use? Canvas Go or React by chance? I just ordered my Deluge a few days ago, trying to get all my ducks in a row before it gets here. Pondering going all out for 512gb if it's capable, perhaps a PNY 512 for $150., though that's a helluva lot of folders and samples to navigate at once ..maybe it'd be better for me to get a few 64gb to swap as needed. Are there any SD brands or types that we know don't work? Hello, say I buy a 64gb Sandisk Ultra... will it work? It should do if you format it with the program linked in the first post in this thread. lexar 2000x 64 GB dont work for me:(! I was able to format a 128gb Sandisk ultra A.S. fat32 using GUIformat, but after transferring many samples to it, Windows stopped being able to read the file structure. The sd card showed 57gb free, but would not show my directories or files that I had transferred to it. I had to fix the GUIformat program to run in Windows 8 compatibility mode to even get it to format the 128gb drive as fat32 first. I’m going to try a Linux bootable cd and see if I can get it to read and write better to the fat32 sd card. I have all my samples on a usb drive and could transfer them to the sd card using the Linux OS running on cd and RAM. I’ll let you know how it works out, but too many issues trying to get it done in Native win 10. Kind of disappointed because both my mv8800’s are running 128gb ssd pata drives and hold all my samples plus a bunch of Roland multisamples for S750 that the mv8800 reads with plenty of room still for writing songs and projects, so 128gb is about perfect for me for the Deluge if I can get it to work. If the Deluge were able to save songs as complete works with samples used in them in separate song directories, then I could just delete samples that were in general samples folder and put new ones in on the 32gb card, but as it is now, there is no way of knowing the path and exact files used without tedious manual reading or rewriting the xml file to have samples saved off and point to a new path. Maybe a suggestion to have the Deluge be able to copy the sample into the song folder and point to it there once the sample has been chosen and then the xml and sample would stay intact and samples could easily be swapped out of the SAMPLES folder without affecting songs already written.